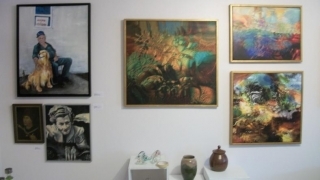 In March 1992 Joyce Honsberger‘s idea for an art gallery found fertile ground in the creative spirits of eleven Niagara artists who took the leap of faith and formed the original cooperative that launched Arts Place Gallery. The well-lit gallery, built in a former gas station near the intersection of King & Main Streets in Old Humberstone, is always welcoming, displaying paintings, sculpture, pottery, glass, jewellery and more. The Gallery averages nine new exhibitions a year. At times it hosts art workshops for adults and children and poetry readings. The mandate is to encourage, support and share experience and information.